1-Asbestos exposure. Asbestos fibers that are inhaled through the mouth and nose may eventually become embedded in the lining of the lungs, causing harmful inflammation of the pleura and resulting in mesothelioma or asbestosis (scar tissue formation in the lungs). 2-Swallowing asbestos fibers could contribute to a form of the malignancy originating in the abdomen known as peritoneal mesothelioma. 3-Family member can be affected indirectly by second hand exposure from an asbestos worker�s soiled work clothes. * When inhaled, asbestos lodges easily in the outer lung tissue and within the mesothelium. The mesothelium is a thin membrane of cells which produces a lubricating fluid on the surface of the organs. This lubricant allows the lung and other internal structures to expand, contract, and move freely without friction in the body cavity. There is a great deal of latency associated with mesothelioma between exposure to asbestos and the onset of symptoms. Over time (often 40 or 50 years) asbestos irritates this tissue, causing inflammation and malignant scar tissue plaques on the surface of the mesothelium. These plaques are the foundation of the mesothelioma tumor. Inhaled asbestos fibers are known to be the cause of pleural mesothelioma, whereas ingested asbestos fibers are the cause of peritoneal mesothelioma. While the exact causal nature between asbestos and pericardial mesothelioma is not known, physicians and cancer researchers surmise asbestos fibers in the blood stream lodge in the outer layers of the heart�s ventricles and lodge in the pericardium. Once asbestos fibers reach the surface of the peritoneum or pericardium, the inflammation process is essentially the same as it is on the surface of the pleura. Diagnostic image tests like x-rays, CT scans and MRI's are useful in obtaining more information about the cancer including how far it is progressed. Each method provides another piece of information for your doctor to assist him/her in making an accurate diagnosis. Chest x-rays are used to identify abnormalities in the lungs including unusual thickening, mineral deposits and fluid in the chest area. CT scans are capable of providing images of the same location from many different angles. MRI technology uses magnetic fields rather than x-ray to provide additional views. 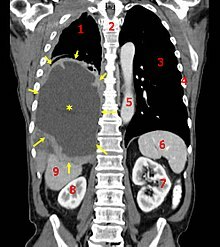 PET Scan - Positron Emission Tomography, more commonly referred to as a PET scan, is a nuclear medicine diagnostic technique. Nuclear medicine involves introducing a small amount of radioactive material into the body (in this case, intravenously) to help doctors determine if the body is functioning properly. PET scans in mesothelioma patients are often used in conjunction with CT scans. PET scans can be particularly helpful in determining if the cancer has metastasized beyond its point of origin. CT Scan - A Computer Tomography scan or CT scan, as it is more often referred to, is a commonly utilized method for locating the tumor in the body and determining the extent of the disease. Doctors will often prescribe a CT scan if mesothelioma is suspected because it offers more detail than a traditional X-ray. The CT scan provides cross-sectional imaging of the internal body structures that can be reconstructed on a computer monitor. MRI - A magnetic resonance image, more commonly referred to as an MRI, is a noninvasive method used for diagnosing mesothelioma within the body. The MRI uses a magnetic field and radio frequency pulses, transmitting them to a computer. Traditional MRI equipment consists of a cylinder within which the patient lies. The MRI poses no risk for patients, though some find the enclosed spaces uncomfortable. These patients may request a mild sedative to allow them to remain still and calm during the procedure. X-Ray - An x-ray is a commonly utilized mechanism not only for cancer diagnosis but for many different respiratory abnormalities, including bronchitis and pneumonia. Nevertheless, given that the symptoms of these respiratory disorders closely mimic those of malignant mesothelioma, often a chest x-ray is the first imaging technique used in a mesothelioma diagnosis. X-rays are particularly adept at identifying the proliferation of fluid within the pleural cavity, a symptom of mesothelioma known as a pleural effusion. If effusion is detected in the pleural cavity, doctors will often prescribe a surgical biopsy to test the fluid for malignant mesothelioma cells. A biopsy is an important diagnostic procedure recommended by doctors for patients presenting with signs and symptoms of mesothelioma that have a history of asbestos exposure. Fine needle aspiration is the less invasive type of biopsy that can be performed. More invasive surgical biopsies are recommended if results from a needle biopsy are inconclusive or if a needle biopsy is not recommended for medical reasons. Needle Biopsy- The needle biopsy is considered the less invasive biopsy procedure. A pleural biopsy is generally recommended for patients in whom mesothelioma is suspected. Fluid is extracted through a syringe and then tested for the presence of malignant cells. Upon determining the presence of malignant cells, cancer specialists will determine the cellular classification of the malignancy and if mesothelioma is, in fact, present. The extraction of fluid from the pleural cavity, chest wall, or abdominal is also used as a palliative procedure to alleviate patient symptoms. Surgical Biopsy - A surgical biopsy is a far more extensive procedure than needle biopsy. Nevertheless, these procedures are sometimes necessary to make a conclusive diagnosis of mesothelioma. Surgical biopsy can be particularly useful once a diagnosis has already been established. For instance, a mediastinoscopy is a procedure, which assists physicians in staging the cancer. Once cancer is effectively staged, treatment recommendations can be made based on the best possible scenario for each individual patient�s circumstances. Only about 1 in 5 patients with metastatic pleural mesothelioma undergo surgery. There are two main surgeries: pleurectomy/decortication, in which the surgeon tries to remove as much of the tumor from around the lung as possible, and the more radical extrapleural pneumonectomy, in which the lung itself is removed. There is a lot of debate as to which is �best,� said Dr. Rice, although studies find that most long-term survivors have had surgery. He personally believes that pneumonectomy is best for tumor control if followed with radiation. Studies find it prevents tumor recurrence in the chest in 80 to 85 percent of patients who have the surgery. However, Dr. Rice noted, it is a long, intensive operation with a 55 percent complication rate and a 3 percent risk of death, higher in some institutions. �So you only want to perform that surgery if the patient has a reasonably good prognosis,� said Dr. Rice. Translation: it doesn�t appear that the cancer has spread outside the chest. Patients best suited for pneumonectomy are younger, with the epithelial form of the disease, no obvious lymph gland involvement, and are otherwise healthy enough to withstand the rigor of the procedure. Dr. Rice actually waits until he has the patient�s chest open in the operating room and biopsies the lymph nodes before deciding which procedure to perform. Pleurectomy/decortication has a higher failure rate, with the tumor recurring in the chest cavity 50 to 80 percent of the time. However, that rate may change with improved radiotherapy techniques, Dr. Rice said. The reason for the high recurrence is that it�s impossible to completely remove the tumor without removing the lung. However, he noted, there is no difference in survival rates between the two surgeries. Part of the reason is that the cancer has often spread to other parts of the body by the time it is diagnosed even if it appears to be confined to the chest. Chemotherapy, also known as systemic therapy, uses oral or infusion-based medications to kill cancer cells throughout your body. Chemotherapy is used both before and after surgery, as well as in people who can�t handle surgery. It is also used in the palliative setting to reduce pain and improve quality of life. The most commonly used chemotherapy drugs for mesothelioma are cisplatin combined with pemetrexed (Alimta) or raltitrexed (Tomudex). Other combinations include gemcitabine, carboplatin or oxaliplatin. If you can�t manage combination therapy, your doctor may start on just one drug. Sometimes, your doctor may infuse the medication directly into your chest cavity, a procedure called pleural chemotherapy, or, abdomen, called intraperitoneal chemotherapy. You may also get a second course of chemotherapy, called �second-line� chemotherapy, with pemetrexed or other drugs, raltitrexed plus oxaliplatin, or the triple drug combination of irinotecan, cisplatin and mitomycin. Some centers are beginning to provide intraperitoneal chemotherapy before surgery, followed by chemotherapy shortly after surgery. You can learn more about this approach here. There is also work underway to personalize chemotherapy based on the genetic characteristics of your tumor. Radiation can be an important part of mesothelioma treatment. The problem is that because the cancer is near the heart and lungs, it�s challenging to provide the kind of high-dose, intensive therapy needed to shrink the tumor. However, a newer option, intensity-modulated radiotherapy (IMRT), which can more accurately target cancer cells and avoid healthy tissue, may provide better results when performed by experienced clinicians. Investigational therapies are being explored through clinical and surgical trials at many of the nation�s top cancer centers. There are more than 50 studies on new therapies for mesothelioma in the U.S. that are looking for volunteers. Researchers are investigating new targeted drugs and chemotherapies, as well as new protocols for giving the medications; immunotherapy, which harnesses the power of the immune system to fight the disease; phototherapy, in which you are injected with a drug that bonds to cancer cells and is activated by high-intensity light; genetic therapies; and novel radiotherapy techniques like tomotherapy to treat the disease. Learn more about participating in a clinical trial here. At some point, the management of the disease will shift from trying to cure the disease to trying to keep the patient as comfortable as possible for as long as possible. This is the palliative care stage, when many people enter a hospice program. The primary goal at this stage is maximizing patient comfort. Medication to help with pain, difficulty breathing, and other symptoms that may be experienced is a mainstay. So is emotional and spiritual support for you and your family. Alternative therapies for mesothelioma can be used to ease side effects of traditional cancer treatment. Complementary and alternative medicine (CAM) includes such therapies as massage, acupuncture, and meditation. They can be a powerful part of your overall management plan, helping you better manage the stress and anxiety of the disease and conventional treatments. Mesothelioma systems described and patient encouraged to Ask Dr. Gill about mesothelioma cancer and clinical trials of Veglin as a cure for mesothelioma. Mesothelioma is a cancer believed to be exclusively caused by asbestos exposure. While researchers have yet to find a cure for it, palliative treatments have been able to ease discomfort and slow the progression of the disease, allowing patients to live longer after diagnosis. The most common treatments are radiation, chemotherapy, and surgery. Transcutaneous Electrical Nerve Stimulation, or TENS, is an effective method of pain relief that involves no drug interactions, is non-addictive and non-invasive, and has no harmful side effects. It can be used to give palliative treatment to those with the asbestos cancer mesothelioma. TENS can also be employed with other traditional means of treatment to reduce the effects of the cancerous cells. Mesothelioma is known as rare form of cancer; usually take place from the cells lining the chest�s sacs or the abdomen. Making a correct mesothelioma diagnosis is very difficult because its symptoms closely resemble other respiratory disorders, thus it become hard to distinguish them. Some of its symptoms include chronic cough, effusions, chest pain etc. However, diagnostic surgeries along with a biopsy are usually required to find out the type of malignant cells, present in the body. Moreover, its treatment includes surgery and chemotherapy to increase life expectancy of patient.